WeissCANNON is blowing up the value string market with this value priced offering that delivers ridiculously precise performance at a price point that will make your wallet smile. 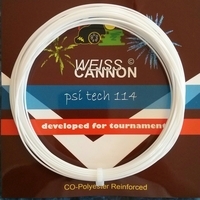 Using advanced high tech string materials and construction techniques, WeissCANNON delivers a product that delivers on the promise of outstanding power and exceptional ball control. Using a thoroughly efficient manufacturing process and combining it with efficient supply chain management, WeissCANNON delivers a string to the marketplace that easily competes with strings available at twice this price. Why We Carry This String: HUGE value! Easily outperforms strings at the twice the price.